(Nanowerk News) A Tufts University chemist has discovered a way to select specific surfaces of single-crystal ice for study, a long-sought breakthrough that could help researchers answer essential questions about climate and the environment. The discovery is detailed in the Proceedings of the National Academy of Sciences Online Early Edition, publishing the week of October 26 in advance of print ("Producing desired ice faces"). "Ice crystals are ubiquitous and could hold the answer to some very important, fundamental questions about our environment, but until now we haven't had the tools to reliably reproduce ice crystal faces in a lab for study," said Mary Jane Shultz, Ph.D., professor of chemistry in the School of Arts and Sciences at Tufts University. "This new process will open the door to areas of research that have been closed to us previously." Scientists have been pursuing a reliable way to prepare ice crystal surfaces in the laboratory since at least the 1930s, according to Shultz, and she began trying more than 15 years ago. "I thought I'd grow a piece of ice and be done, but it's a very unusual material and challenging to work with. Previous methods of growing and preparing crystals were not reliable and yielded results that were not reproducible." These limitations hindered scientists' ability to examine the molecular-level structure and dynamics of ice. That has left gaps in our understanding of the important role that ice plays in the environment, such as transporting substances through outer space, shaping the earth's surface and processing ozone-damaging molecules in the stratosphere. 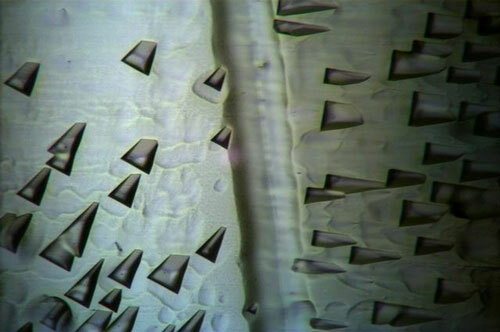 In 2013, Shultz's lab took a giant step toward removing these limitations by inventing a special apparatus to grow large samples of single-crystal ice. But selecting a specific face from that ice remained elusive. Shultz credits her most recent breakthrough to simple geometry and trigonometry. The most common type of ice, called Ih or "ice one h," is made up of water molecules in a hexagonal crystal shape in an orderly, repeating arrangement called a lattice. Shultz found that by using certain measurements and formulas, she could determine the crystal's lattice orientation as it relates to a surface and use that orientation to make precise cuts of any of the crystal's faces.